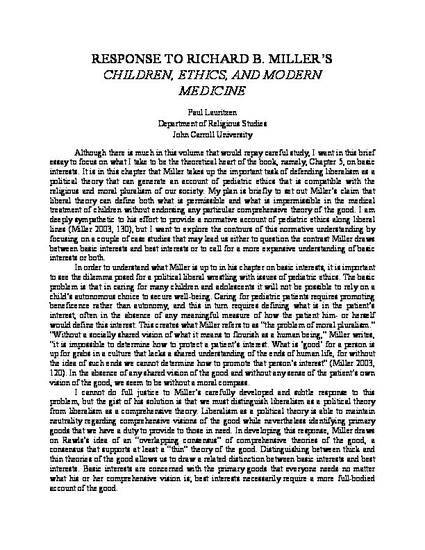 This essay examines Richard B. Miller’s liberal account of pediatric ethics by asking if the duty to promote a child’s basic interests is substantial enough to secure the well-being of children. This question is raised in light of two case studies: daytime TV talk shows that broadcast interviews with sexually active children, and a medical study conducted to test the effect of growth hormone treatment on adult height in peripubertal children. In both cases, Lauritzen argues, children are subjected to potential harms that are not easily explained, and therefore not easily prevented, by appeals to basic interests. This is an Author's Original Manuscript of an article whose final and definitive form has been published in the The Journal of Religious Ethics.